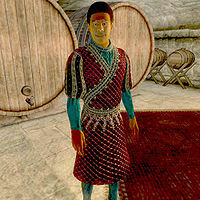 Talan is a Redguard commoner who is the vintner in Battlehorn Castle. He appears after you buy the Battlehorn Wine Cellar upgrade from Nilphas Omellian and will hand you the list of ingredients he requires for his unique wines. He is the brother of famous vintner Tamika. He wears a red velvet outfit and a pair of thick cowhide shoes. He carries a cheese wedge, some bottles of Tamika Vintage 399, and a moderate amount of gold. He sleeps in the small room just outside the wine cellar between midnight and 6am and eats his one meal of the day in the east wing between 8pm and 11pm. If he doesn't have any wine to make, he spends the rest of the day pacing around the cellar or sampling the best wines in the cellar - nothing worth less than 10 gold. His main task is keeping the cellar fully-stocked with wine. If any of the barrels of unique drinks contain less than eight bottles-worth, and if he possesses the right ingredients, Talan will make a new bottle to top up the barrel. Frostdew Blanc at 6am, Colovian Battlecry at 8am, Julianos Firebelly at 10am, Numbskin Mead at midday, Stumblefoot's Reserve at 2pm, Argonian Bloodwine at 4pm and Sparkling Honeydew at 6pm. If the barrel of mead holds less than 20 bottles, he will make another of those at 7pm and the same for cheap wine at 8pm - delaying his dinner for a while. This page was last modified on 25 March 2018, at 03:15.